The Interoperability > List > Productions page allows you to create a new production and open, export, document, or delete an existing production. After you open a production, InterSystems IRIS™ displays the Production Configuration page, which allows you to configure, start, and stop productions. To configure the current production, you can select Interoperability > Configure > Production, which also displays the Production Configuration page. Once you are working in a production, you can use the Actions tab to switch to a new or another existing production or to document or export the current one. Later chapters describe how to add business hosts and configure settings for the production and all business hosts. If a production is Suspended or Troubled, see “Correcting Production Problem States,” in Monitoring Productions. If you are not already in an interoperability-enabled namespace, choose your working namespace from the available interoperability-enabled namespaces. Navigate to the Interoperability > List > Productions page, and then click Go, if necessary. Select New to create a new production. Enter a Package Name, Production Name, and Description. Now you can add business hosts and configure them, as described in later chapters. Navigate to the Interoperability > List > Productions page, and then select Go, if necessary. Select Open to open an existing production. If you have clicked anywhere within the diagram, click Production Settings. This step returns the focus to the production and changes the options on the Actions tab. Select Open on the Actions tab to open an existing production or select New on the same tab to create a new production. For example, the following figure shows a sample production. A specific business host experienced an error and has died (the most likely cause). You changed a configuration parameter for a business host in a running production, such that the host now needs to be restarted. You enabled or disabled an item in a production, and this action requires the production to be stopped and restarted. A production typically opens a Terminal window, but this window was closed by a user action while the production was still running. When such discrepancies occur, the Production Configuration page displays the Update button. Click this, and InterSystems IRIS updates the production to resolve the discrepancy. This section describes how to filter the display, sort the display, how to display alternative views of the production, and how to control the refresh of the display. To filter the business hosts in the production diagram, use the Category list. Select a value from this list. When you do so, the diagram display only those business hosts that have been assigned to the given category. Or click All to view all the business hosts in the production. Note that a business host can be assigned to multiple categories. Name  Sorts items alphabetically within each column. 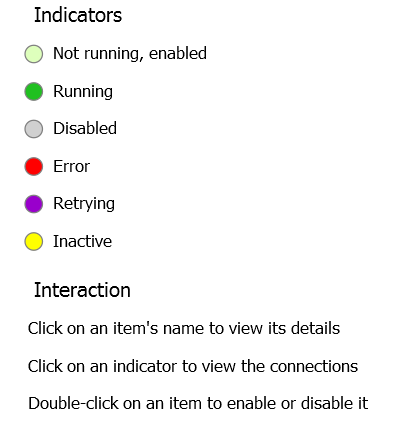 Status  Sorts items within each column by status as follows: disabled, enabled, error, inactive. Number  Sorts items as listed in the production class (which, by default, represents the order in which they were added to the production). To modify this order, you can edit the production class in Atelier. The listing view displays the business hosts in lists, within the Services, Processes, and Operations columns. This is the view used in most of the documentation. The monitor view represents each business host in a larger circle where you can easily see items that may need attention. Here, click a circle to see a box with details for the business host. The service bus view is relevant only if you configure business partners and enter values in the Business Partner setting. This view displays the business hosts grouped by their associated business partners. Click the circular arrow to refresh the diagram once or click on to reload a fresh copy of the production diagram every 60 seconds; the refresh timer is off by default. Note that InterSystems IRIS checks the status of individual business hosts (on a shorter interval) and refreshes the display for individual hosts as needed, regardless of the setting of auto-refresh. You can increase the visibility of the error states by specifying that the Error, Retry and Inactive states are to be indicated by a colored ellipse, not a circle. To do this append &VISUALAID=1 to the URL for the Production Configuration page. Click Start and answer OK to launch the Start Production dialog box. It displays the name of the production, its startup status, and any messages associated with production startup. If any Terminal windows open as a result of starting the production, do not close them. When the startup dialog shows it is Done, click OK at the bottom of the Start Production dialog box. This option is primarily for use during development. For a live, deployed production, InterSystems recommends that you use the auto-start option. See “Starting and Stopping Productions” in Managing Productions. Click Stop and answer OK to launch the Stop Production dialog box. It displays the name of the production, its shutdown status, and any messages associated with production shutdown. When the shutdown dialog indicates it is Done, click OK at the bottom of the Stop Production dialog box. If you click this command, the production is forced to shut down. InterSystems IRIS displays an informational message if you try to stop a production that is not running. If you have clicked anywhere within the diagram, click Production Settings in the right-hand pane. Click Export on the Actions tab. Select whether you want to export the production to the server or to your local machine via the browser’s downloading capability. If you are exporting to the server, enter a path and name of the export file. If you are downloading to your local machine via the browser, enter the name of the export file. See Deploying a Production in Developing Productions for details on exporting and deploying a production. From the Interoperability > List > Productions page, select a production name and click Document. From the Interoperability > Configure > Production page, on the Actions tab for the production, click Document. Click View to display the online documentation you previously generated. If you click View and no HTML documentation exists, you can choose to generate it. Click Generate to create new documentation for this production using a background job. It may take a considerable amount of time to generate documentation for large productions; therefore, you may not want to generate new documentation if you have not made changes to the configuration of your production. Cancel to cancel the operation. CreateDocumentHTML()  creates new documentation in HTML format. RemoveDocumentHTML()  removes existing HTML-format documentation from the current namespace. CreateDocumentPDF()  creates new documentation as a PDF file. The PDF format requires that you have a PDF renderer installed. It also requires Java. Navigate to the Interoperability > List > Productions page. Click the production that you want to delete. Click New to start the Production Wizard to create a new production in this namespace. Click Open to display the Production Configuration page for the selected production. Click Export to export the selected production. See Deploying a Production in Developing Productions for details on exporting and deploying a production. Click Delete to delete the selected production. Click Document to view or generate configuration documentation for this production. Enter text in the Search text box to search for productions that contain the specified text in their definitions. Production Name  The name of the production. Status  The status of the production. If a production is Suspended or Troubled, see “Correcting Production Problem States” in Monitoring Productions. Last Start Time  The date and time when the production was last started. Last Stop Time  The date and time when the production was last stopped.